DirtyPilot has brought together 2 legendary writers of the 1970’s, STAYHIGH149 & LSD OM. Highlights from this show include collaborations by the two, the likes of which have not been seen in decades. The two tags side by side were dazzling then and even more stunning and rare now. Check out these new works now at DirtyPilot.com. LSD OM began his writing career on he upper west side of Manhattan in 1969, he has the rare distinction of being the only writer from the 60’s to go on to do pieces on the trains. At the height of his writing career, from 1973 to 1976, LSD OM wrote with every great writer of his generation, including a partnership with the legendary STAYHIGH 149. In 1974 LSD OM and FLINT created the graffiti crew the Rebels, a crew that helped pave the way for RTW years later. Writers who have acknowledged his influence include HAZE, ZEPHYR and REVOLT – now it’s your turn. Wayne Roberts was born in1950, his family migrated to Harlem in 1958 and the Bronx ten years later. By 1969 the New York City graffiti movement had begun and Wayne took an immediate interest in it; he preferred writers with a message or slogans like Pray, Worship God and Free Huey. 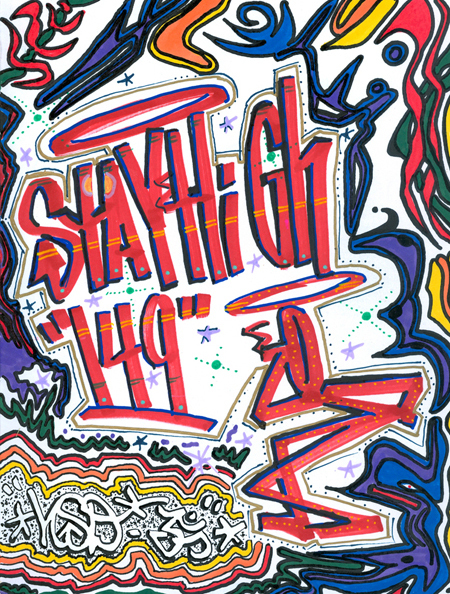 His friends on the grand concourse began calling him STAYHIGH because of his penchant for smoking weed, he liked the nickname and in 1971 he added the number 149 to it to become STAYHIGH 149. In 1972 he completed the signature by adapting the stick figure from “ The Saint “ TV show, he gave it a joint to smoke and unified it with his tag. It was far and away the most stylized signature of it’s time. STAYHIGH hit the streets and trains with his ornate signature for two straight years, he was considered by many to be an all – city king. He became so famous that his face appeared in “New York” magazine in 1973, without the anonymity he was quickly arrested while writing in Brooklyn and he knew he had to give up his name. He floundered for a while until one day, on the way to work, he came up with his second name: VOICE OF THE GHETTO. At a time when writers were using smaller names Wayne Roberts chose to go big, the name VOICE OF THE GHETTO could soon be found on many of the IRT train lines in a very unique style – he would write the name with a three toned magic marker that was two inches thick called a uni – wide. By the end of 1975 he had retired from graffiti, he would soon disappear from the graffiti community altogether with rumors touting his untimely demise. In the summer of 2000 there was a small graffiti show in Brooklyn that attracted hundreds of writers, after a twenty five year absence Wayne Roberts re-emerged. That night, in a two hour period, he signed over 400 autographs and finally slipped out a back door from sheer exhaustion. The New York Times covered the story in it’s metro section the next day. Soon, STAYHIGH began to adapt his talents to canvas selling to private collectors all over the world. As a graffiti icon he’s done work for companies as diverse as Reebok, Ecko Unlimited and Zoo York.